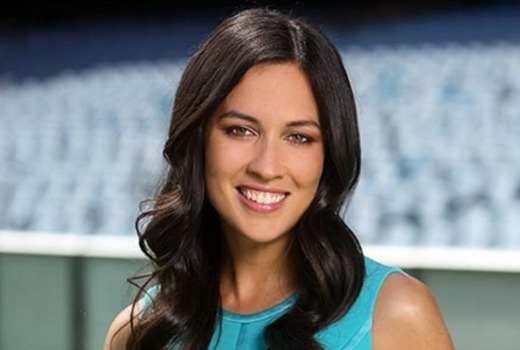 Sports presenter Mel McLaughlin will depart TEN after three years with the network, and is Seven-bound. “Mel has done a great job at Network TEN and we wish her the best for the future,” a TEN spokeswoman has told News Corp.
McLaughlin, recently on the end of brash comments by cricketer Chris Gayle, will now have the opportunity to cover the Rio Olympics with Seven, plus major upcoming events. She will continue to work at TEN until her contract ends in coming weeks. All of TEN major tv talent ends up at 7 or 9. 7 has a decent history of having attractive and capable female talent working for 7 Sport. They had Kylie Gillies doing Olympics and Australian Open, as well as Johanna Griggs. Mel will fit in well at 7 Sport, not doubt she will be hosting and reporting although i cant see her doing any actual play by play commentary. Network Ten attempted that with little success when Kellie Underwood called a AFL match in 2007 that didn’t go well. Everyone poaches everyone Nines soon to be former head of Sport Steve Crawley will be FOX Sports head of Live productions. Good luck to her at 7 Sport. Well at least she doesnt have to speak to Chris Gayle anymore. But I think she will be great on 7. She will be great on the Olympics and also they should get her to do something at the tennis over summer. Even the Melbourne Cup and spring carnival. Even cover sport on the news. Good luck to Mel and her commitments to Rio 2016 and GC2018. Hope she covers Aus Open from Jan 2017. Are the keeping Sam for the Saturday footy show? I don’t mind her and its good to have women in such a male dominated sport. Good move by Mel many more opportunities at Seven, now if Seven can lure Angela Pippos and Neroli Meadows in they will have a good team (along with Sam Lane), for the Womens AFL matches that start in 2017 (Mel would be the anchor, then the other 3 would fill the various commentator duties). No loyalty in media. Look what happen to Matt White. Great signing for Channel Seven – she is a versatile, intelligent sports presenter, and will be a real asset to the network. As usual Seven poaches talent from another network. Can they not nurture their own talent? I tend to agree. The number one network should be able to promote from within and not poach as much as it does or tries. But then again Seven’s strategy seems to be as a follower (eg MKR, House Rules, and dating shows this year) rather than an innovator, then effective, relentless promotion. It even copies elements of how ABC America operates. Have always enjoyed Mel’s work, but have always felt cricket wasn’t her thing. Olympics and ‘The World Game’ are probably her strengths. At least she’ll get to anchor the Melb Grand Prix before she departs. Good luck to her. I must admit I found her stilted style of delivery quite annoying, mind you it has become prevalent across many sports presenters in many sports. Breaking sentences with awkward punctuated silences does not enhance the perceived skill of the broadcaster. I’ve got a feeling Tara Rushton will replace Mel on Ten. It would have been very, very, very hard to say no to all the opportunities at Seven! Good on her, and all the best.